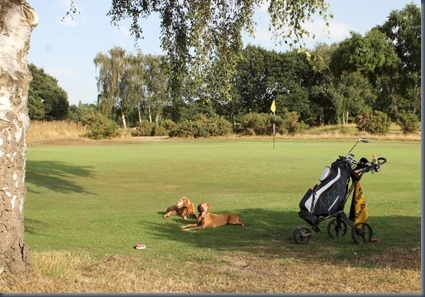 Welcome – The pro shop was most enthusiastic when I double checked about the dog friendly protocol. His response was that “most golf courses are aren’t they?” Well, unfortunately not (only about 15%), but it was encouraging to hear him think of it as “normal”. 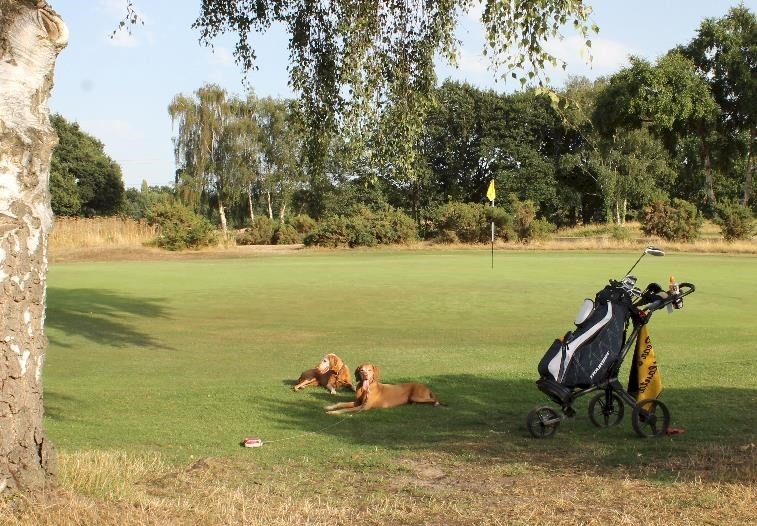 During the round, we also noticed a few local dog walkers passing through so the players must be used to dogs on the course. Walk – The course is laid out on mostly flat countryside. The few elevations seem to be reserved for some precision shot par 3s. Except for the sand bunkers. Or should I say “sand abysses”. The course designer Harry Vardon made extensive use of “sleeper faced bunkers”. That means, like coal mines, the hole is so deep that you need to prop it up with wood planks. In fact, Hole1 has two bunkers with stairs going down into them (see below). Some sand traps seemed like they would benefit from lifts descending into their depths. But Hole 1 is nothing compared to the hole right after. Hole 2’s entire fairway is a sunken hazard topped by an edifice of sleepers more intimidating than Pointe du Hoc. Like baleen plates of a Blue Whale that has beached itself on the course and has taken to gorging on golf balls instead of krill. 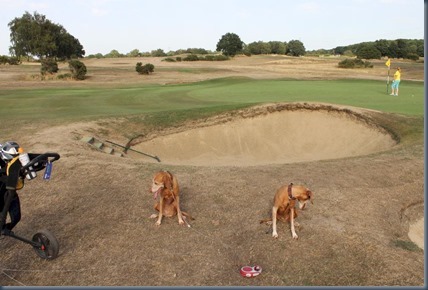 Throughout the course, some side of the bunkers are more suitable for abseiling than pitching. Water – No natural bodies of water on this savannah like plain, but the course has provided water fountains at the 6th and 12th holes (which provided a fresher drink for the girls that the water in the bottles getting tepid in our carts). Wildlife – We didn’t really encounter much in the way of wildlife except the obligatory squirrel here and there. Wind Down – We decided that after a parching 32 degree round (even well supplied with drink), a doggie pub wind down was not only going to be too late for dinner, but too late for our urgent thirst. So we decided to grab a drink at the Sandy Lodge clubhouse. They have a particularly comfortable outdoor seating area and some alto-cumulous clouds were making for a Sistine Chapel like sunset worth savouring as much as our ice cold beverages. On his own initiative, the bartender also came out with a bowl of water for the girls which was especially considerate. Rusty and Grace hanging their heads in despair at the sand pit chasms. 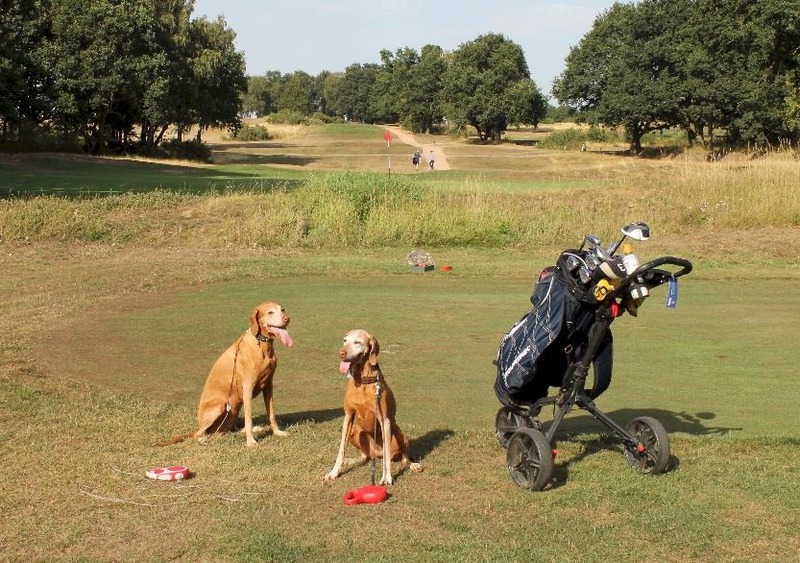 Dog Golf provides information on golfing with dogs in the UK. The foursome is comprised of not-quite-handicap level golfers Bruce and Lori with their Hungarian Viszla companions Rusty and Grace.